Tea for medicinal purposes has a history of 2,700 years in China. Many books, like Shen Nong's Herbal Classic (Eastern Han Dynasty (25-220)), and Classification of Tea (Ming Dynasty (1368-1644)), all recorded the tea's effect for medicinal purposes. Tea Classics, written by Lu Yu of the Tang Dynasty, recorded 24 examples to show tea's pharmacology effect Tea contains more than 5,000 biochemistry ingredients closely correlated to human body. Tea not only can refresh the mind, clear heat, and help people lose weight, but also has certain pharmacology effects on some modern diseases, like radiation sickness, cancer, heart disease, and blood sickness. People who always work in places with air conditioning may face skin problems such as easily dry skin and the growth of small wrinkles. Therefore, the moisture content of their bodies needs to be supplemented. Among all the drinks, green tea is the best choice. Because there are four primary polyphenols (natural chemicals that are beneficial to health) in green tea and they are often collectively referred to as catechins (types of flavored chemical compounds). Also, green tea, like makeup, can prevent computer radiation. 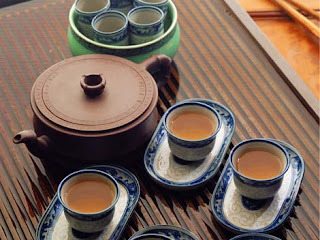 Chinese medicine believes that different people should drink different tea according to the different characteristics and tastes of each kind of tea. Black tea can warm the stomach, refresh the mind, and accelerate digestion. Therefore, drinking warm black tea in the cold winter is a most suitable choice. Strong tea may make the human body excessively excitable and can badly affect the cardiovascular as well as the nervous system. For a person who has cardiovascular disease, to drink overly strong tea may induce heart and blood pressure disease, or even the relapse of old illnesses. Drinking too much tea or strong thick tea may affect the absorption of many constant elements (like calcium) and trace elements (like iron and zinc). Also, people should not drink tea with milk or other milk products because the caffeine and tannin (a kind of complex organic compound) in the tea may reduce the nutritional value of milk products.